Why does Employee Branding matter? Danny Gosling is Founder and CEO of Thinkography. In this blog, he talks about why employee brands matter and his passion for creating powerful internal communication that can change businesses. Thinkography are based in Montacute, near Yeovil in Somerset and for the last few months have been working with Sarah Hannah from The Passionate PA. We have been super impressed with Danny’s vision and knowledge, so felt it only fitting that he become our first ‘guest blogger’. I’ve been a graphic designer all my career, for 25 years. In that time I’ve worked freelance for a large number of global brands (CocaCola, BMW, Nissan, Barclays, Manchester United, to name just a few), however, I knew all along that I wanted to have my own design agency. And so Thinkography was born. It was Thinkography’s work with Clarks Shoes at their HQ in Street, Somerset, that really developed my interest and expertise in employee branding. Having worked freelance in their marketing studio, I noted how much effort and resource went into developing their brand for their customers, with little thought given to how their employees felt about representing that brand. And when I thought about all the other companies I’d worked with, very few seemed to see their people as part of their brand at all. It struck me how much this potentially undermines even the most effective marketing efforts: after all, it is employees who interact with customers and are the human face of your brand. How much more powerful could your brand be if employees genuinely felt connected with the company they work for, and were able to share in the vision that drives the company and find a greater sense of purpose in their work? Clarks and Thinkography now work closely together to develop their employee-focused internal brand that will excite and inspire their people today and in the future. This, of course, plays an important part in helping them recruit the best people. Part of my goal for every client is to help them become the number one choice of employer for the most talented people in their sector. Branding is only partly about how your marketing material looks. Think of it as the promise you make to your customers, and how you fulfil that promise. It is much more about how your business behaves. Imagine the power of a motivated, inspired team of enthusiastic brand advocates, meeting your customers (and potential customers)… Living and breathing the values of your brand every day. Demonstrating why you’re the company they should buy from. Now that’s power! We believe that to deliver your full potential as a business, whether you have a team of 5 or 500, and whatever your stage of development, you need to take an integrated approach to your branding – it’s just as important that your employees love your brand as it is that your customers do. Thinkography ensure that your external marketing, employee brand and customer interaction work together in harmony. 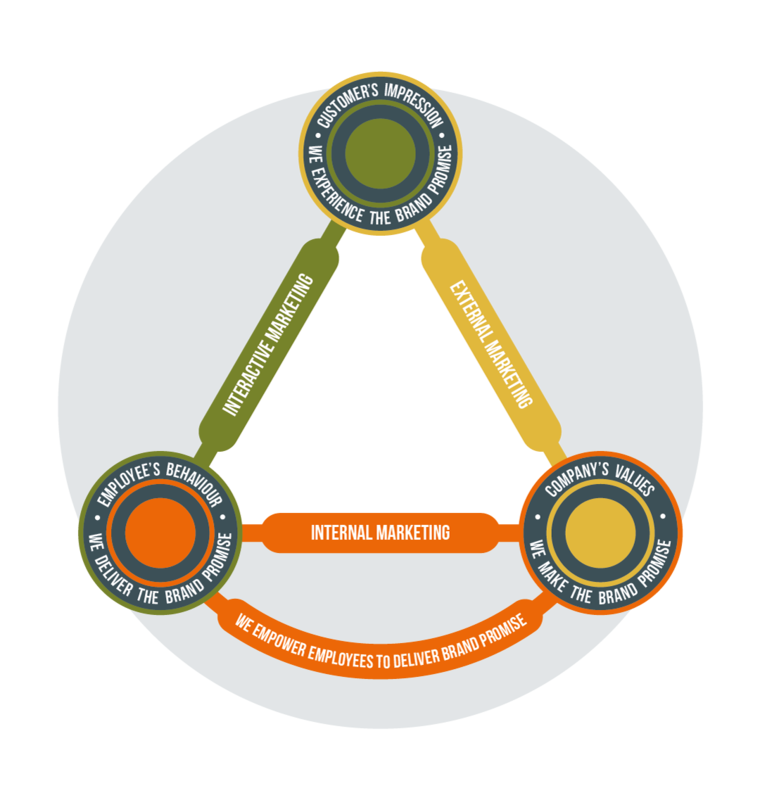 That’s shown in our brand triangle model here. You can see that with all three sides in place, you have a strong and cohesive brand that enables you to deliver a consistent experience to your customers. Remove your employees from the model, and the triangle collapses. Truly effective brands are built from within. We apply the same insight and creative skills as we’d use to communicate your brand through your customer marketing, to build a brand that resonates with your own people. The act of doing this is powerful in itself; simply by focusing your efforts on your employees you will increase engagement and develop a stronger bond. Do this with the same commitment and energy as you would apply to your external branding, and you’ll be more than repaid with your team’s increased motivation and commitment. The vision you have for your business, and why this motivates you and those around you. Only when we’ve helped you understand and define these vital pillars will we design the visual brand that will communicate your message. Too many companies fail to understand the rewards that a carefully considered and well-designed employee brand can bring, and how it’s a vital component of your marketing mix, for any size of business. It’s therefore a great opportunity to gain a significant advantage over your competitors. Above all, it will help you bring a powerful team of highly-motivated advocates along with you on your journey as a company, sharing your vision, and reaching heights that simply wouldn’t be possible without their full-blooded support. Think of it like that, and you can’t afford to overlook the power of a strong employee brand. If you’d like to talk more about how you can create your own employee brand and how it will help you, then Danny would love to speak with you. Get in touch on 0117 990 2390 or email: danny@thinkography.com. Or visit www.thinkography.com.